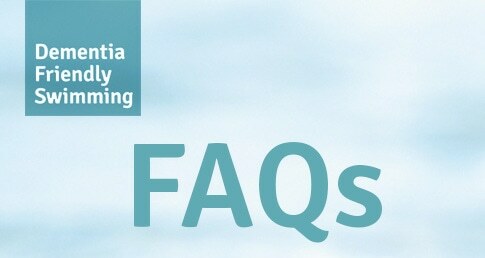 If you have questions about the project read our Dementia Friendly Swimming Project FAQs below first. What is the Dementia Friendly Swimming Project? The Dementia Friendly Swimming Project has been created to enhance the swimming experience of those living with dementia and their carers by improving facilities and removing barriers. Over the next three years the project aims to create a network of dementia friendly swimming pools across England. Why has the Dementia Friendly Swimming Project been created? Dementia is one of the biggest health challenges facing us today with around 670,000 people affected in England and over half a million carers. Swimming has been shown to have a positive impact on people living with dementia yet we know that some people living with dementia and their carers find going to a swimming pool a daunting experience. We want to change this perception by removing barriers and ensuring that swimming pools are as safe and welcoming as possible to help encourage more people to enjoy the benefits of swimming. Swim England is working with local authorities to create local partnerships of public health professionals, adult social care, health trainers, community groups and those living with dementia and their carers to create a network of dementia friendly swimming pools across England. To build a network of dementia friendly swimming pools for people living with dementia and their carers. To produce guidance for pools and those in health care provision. To develop and deliver specific qualifications and building a network of deliverers. Which areas are you working in? The project will be focused in County Durham and the City of Manchester during the first year and then expanded to include swimming pools in Leeds, Nottingham, Barking and Dagenham, Bristol and the London Aquatics Centre. By the end of the third year (2017) the project aims to be working with over 100 swimming pools across England. How will you encourage people living with dementia to go swimming? As well as creating a safe and welcoming environment outside the pool we will be working with our partners to deliver a range of low intensity exercise classes, relaxation sessions and structured motivational swimming lessons all within the right environment for people living with dementia and their carers. How will you ensure the pool environment is safe and welcoming? We will develop guidance and training for facility operators and their swimming and front line staff to ensure that the needs of those living with dementia and their carers are fully understood. This includes raising awareness of dementia and potential barriers, and also being able to anticipate an individual’s needs. By the end of the third year (2017) we hope to be working with over 100 swimming pools, have trained 300 key swimming staff and 300 staff in front line roles, and developed additional trainers to help teach other people. We also aim to have positively enhanced the swimming experience for more than 3,000 people living with dementia and helped a further 1,500 adult carers to gain practical swimming experience. The Dementia Friendly Swimming Project was one of 30 voluntary sector projects to be awarded a grant in 2014 by the Department of Health’s Innovation, Excellence and Strategic Development Fund (IESD). For more information click here. How can local authorities and pool operators get involved with the Project? Local authorities and pool operators interested in becoming a Dementia Friendly Swimming Project partner can register their interest by clicking here. Can individuals get involved with the Project? Yes, we would like to encourage anyone living with dementia, or who may be caring for someone with dementia, to share their views, experiences and suggestions and help us to develop our work. People can either email dementiafriendly@swimming.org or take part in a short survey that can be accessed here. Where can I find out more about dementia? Alzheimer’s Society works to improve the quality of life of people affected by dementia. For more information visit: www.alzheimers.org.uk.